New research challenges the traditional thinking that how much protein you consume should correlate with body mass. 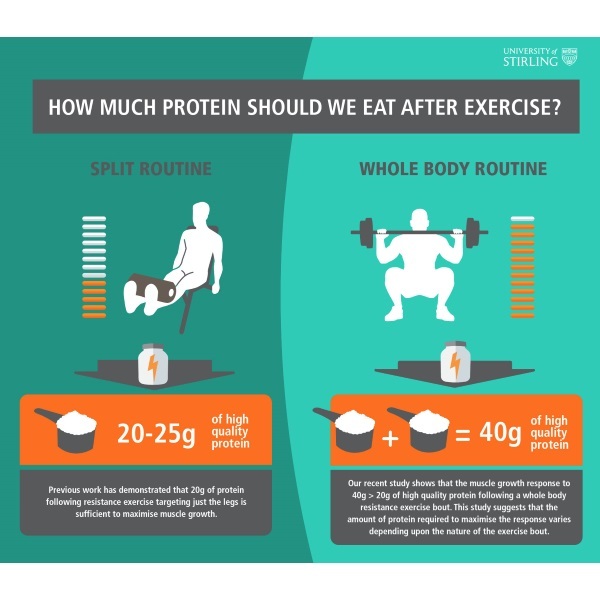 When it comes to how much protein you need after a workout, personal trainers and registered dietitians pretty much agree you should aim for 1.2 to 1.7g of protein per kilogram of bodyweight every day if you’re looking to bulk up (so a 200lb guy should get between 109 and 154g daily). If you’re shooting to consume protein somewhere in that range, like 120g per day, divide that into four separate meals that you’ll eat roughly four hours apart. This way you’re getting upwards of 30g of protein at every meal, which fuels your muscles with leucine (about 2.5g per meal). Research also suggests there’s a protein ceiling. In other words, there’s a cap on how much protein your body can use in one sitting to build and repair muscle. For a 175-pound male it’s about 30g of protein; for bigger guys, like someone who’s 250 pounds, protein intake should rise to about 42g. In this new study, published in Physiological Reports, researchers recruited 30 young, resistance exercise-trained males and divided them into two groups—one with lower lean body mass of less than 143 pounds (65 kilograms) and one with higher lean body mass of more than 154 pounds (70 kilograms). All volunteers participated in two trials in which they consumed protein after a full-body weightlifting routine. * In one trial the men consumed 20g of whey protein; in the second, they consumed 40g of whey protein. Scientists measured their muscle’s ability to grow at an increased rate via metabolic tracers and muscle biopsies. Participants completed, in this order, chest press, lat pull-down, leg curl, leg press, and leg extension. All leg exercises were performed unilaterally; and participants worked at 75% of their 1 RM at a cadence of 1 sec concentric, 2 sec eccentric contraction. The men were instructed to complete three sets of 10 reps with a final fourth set to failure in order to make sure each participant was working at the same relative intensity. This workout was mirrored in the second trial. This study is the first to find and address whether your total lean body mass influences muscle protein synthesis response to resistance exercise combined with protein intake. And they’re suggesting guys with more muscle mass don’t need more protein after resistance exercise. There was no difference in the muscle growth response to protein after a full body workout between larger and smaller participants when looking at muscle biopsies and blood plasma analyses (including levels of muscle-building leucine). That’s not to say how much protein you’re consuming doesn’t matter. Researchers found participants’ muscles were able to grow and recover quicker and more efficiently from exercise after consuming a higher dose of protein (i.e. 40g over 20g). This increase occurred regardless of how big the participant was. “Until now the consensus among leading sports nutritionists, including the American College of Sports Medicine and the British Nutrition Foundation, is that weightlifters do not need more than around 25 grams of protein after exercise to maximally stimulate the muscle’s ability to grow,” Tipton adds. “In order for nutritionists to recommend the correct amount of protein we first need to consider specific demands of the workout, regardless of athletes’ size,” Tipton explains. This throws commonly held recommendations into question and suggests the amount of protein our muscles need after exercise may be dependent on the type of workout performed. *These results are limited to younger, trained men so results may differ with older men and women of varying ages and experience levels. But if you’re an experienced lifter, you might want to consider upping your protein intake after full-body routines.